"War is hell," Ragnar agreed. He too paced across the bunker, rubbing his hand across the cold metal of the Device until finally, he reached into his pocket and turned the second key. "Yes lieutenant, that's an order!" The officer keyed in the security passcode and, as he threw the final switch, he muttered: "I am become death, destroyer of worlds." The Glaciation Bomb was active. Presently, it began to snow. As the snow cloud blocked out the sun, the glacier began to advance. It crushed the enemy encampment before it would then advance to the ocean and beyond. In time it will crush our encampment too. Mutually assured destruction. But that is the price we pay for absolute victory. The only real winner is the environment. War is hell. But it's a hell that's about to freeze over. 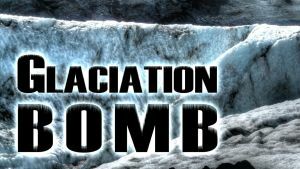 Short story that I wrote when I overheard the phrase 'glaciation bomb' at UoN's Creative Writing Society. Cover image is my own photo, taken in Iceland.